Even at the Sundance Film Festival where one can see just about everything under the sun, there’s bound to be nothing else quite like “The Royal Road.” Transposing some of her own history onto the character of an unnamed tomboy from the Midwest who travels up the California coastline, filmmaker Jenni Olson reflects on the places she’s been – both physically in and around her home city of San Francisco and metaphysically through the movies which have provided an escape, somehow fusing together the histories of her own life as a gay woman, films such as “Sunset Boulevard” and “Vertigo” and the Spanish colonization of California. Discomfort is clearly a theme for Olson, who uses the film to contemplate the roles we take on to fit the landscape both literally and figuratively, but it isn’t a word you’d use to describe “The Royal Road” as a film as disparate as its various story strands may appear at first. In fact, bringing a variety of elements into focus comes naturally for the filmmaker, who has done just about everything one can do in the world of film. Since founding the Minneapolis/St. Paul Lesbian, Gay, Bisexual and Transgender Film Festival as a college student at the University of Minnesota, Olson has not only made films, but has marketed them for the prominent LGBT distributor Wolfe Video as well as being a longtime historian and film writer. (It isn’t every filmmaker who gets into Sundance and then is obligated to write a preview article that includes their own film.) Certainly, analytical thinking and a great consideration of the past as it informs the present has spilled over into Olson’s “The Royal Road” just as it did in her 2005 feature debut “The Joy of Life,” yet in honing in on static environments, she allows the audience to wander and take what they will from the images she presents. Shortly before returning to Sundance a decade after first setting foot there with “The Joy of Life,” Olson spoke about the origins of “The Royal Road,” the process of creating a cinematic essay, and in making a film about history how she was able to create some of her own. You’re involved in so many facets of the film business, is it difficult to actually find the time to make one? It’s true I have a lot of different hats that I wear, but being an experimental filmmaker is the thing that most feeds me as a person. Not literally because I certainly don’t make a living at it, but it feeds my soul as an artist. My background is as a film festival programmer and as a film critic and over the years of seeing literally thousands of movies, I really have always been drawn to experimental work and very influenced by experimental filmmakers ranging from Marlon Riggs, who really pioneered a new style of personal documentary with “Tongues Untied” to Ross McElwee, who made “Sherman’s March,” one of my biggest influences. Sue Frederik, Sadie Benning… there’s a lot of filmmakers whose early work I showed when I was programming festivals or wrote about as a critic and when I decided I wanted to make films, I had always been drawn to experimental filmmaking, especially to this kind of subgenre of landscape filmmaking. But it is hard to fit into the rest of my busy life. How do the ideas for a film like this converge into something you can put together into something cohesive? I’ve been shooting these 16 millimeter landscapes since 1997, which is a few years after I moved to San Francisco. At different times, I’ve been shooting thinking of a particular film, then thinking well, I’ll use this footage eventually. 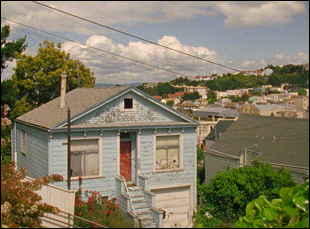 I was at Sundance in 2005 with my first featured landscape film, “The Joy of Life,” then I made a short in 2009 called “575 Castro Street,” which was also at Sundance, because I just felt at the time like I didn’t quite have it in me to make another feature. But I’ve been still shooting since then. Over the last few years, [“The Royal Road”] solidified around certain themes that I found myself drawn to, particularly around the history of Alfred Hitchcock’s “Vertigo,” which was shot in San Francisco, and I walk past mission Mission Dolores probably a couple times a week, so I had an increasing interest in things around the Spanish colonization of California and the Mexican-American War. These are all very disparate topics, but reflecting on them over the years and doing a lot of writing, they came together [in my mind] and I think of “The Royal Road” as a essay film [about] the things that I’m thinking about. Do you actually write a script before shooting or would you look at what you shoot and see what it evokes in your mind to record that voice over? I’m doing it all simultaneously. 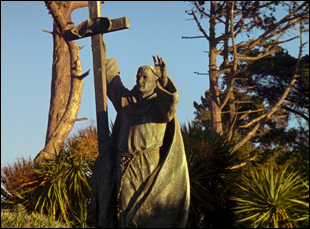 There are some parts where I’m writing and I think I actually really want a shot of this one statue of Junipero Serra in Golden Gate Park, so I make sure to go get it. But for most of it, I have a vague sense of “Okay, let’s go out and shoot at six o’clock in the morning,” so [the streets] have no pedestrians in them, or at 4:30 in the afternoon when the light is just in a certain way. I make notes all the time about shots I want because I think they have a certain kind of atmosphere to them. Then I put together the whole script for the voiceover separately. There is a sense of a certain story arc, if you will, but it’s very unconventional. 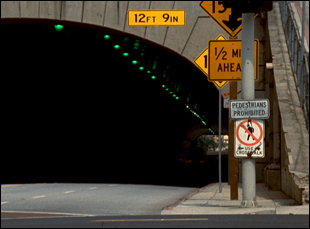 There’s a line [in the film that this character] lives in Los Angeles and I live in San Francisco and [the line goes] “I will follow the Royal Road to her door,” which prompts some movement forward physically, but obviously, it’s very subtle. I pull the script together and then we lay down the voiceover in the order of the script and basically start to put picture down on top of it, making space as we go. It’s really in the editing room where the film comes together because you’re trying different shots and going, “Oh, that one doesn’t really work” and “Oh my god, that is this perfect match.” That’s why I’m so grateful for my production team. My editor, Dawn Logsdon, a local Bay area editor and director who edited my very first short film, is just wonderful and [also] Sophie Constantinou, my cinematographer who has also shot almost everything [I’ve done]. It’s great working with people who you get on the same page with in terms of what I’m trying to achieve. The film is able to evoke memories of classic films without actually using a frame of them for reference visually. Do you enjoy that challenge of describing films and and then creating an image that will allow someone to recall it without resorting to the original film? I also have Kevin Spacey’s house in “American Beauty,” but it didn’t make it into the film, even though I was like, “We have to have that.” There’s tons of stuff that is basically locations from “Vertigo” and since we shot on 16 millimeter film, this particular stock of 50 Daylight [film] that really gives you this very saturated color that at times depending on the light, it can almost look like chronochrome. 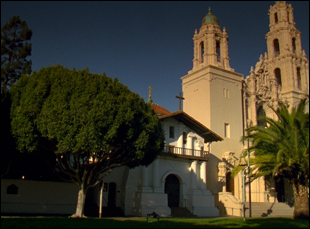 In particular, there’s a shot of Mission Dolores Basilica where I introduce the topic of “Vertigo” that almost looks like it could be a shot from “Vertigo” because it’s this low angle setup and the color looks vintage. Because there’s this theme in the film of being an outsider, did that actually influence the perspective from where you would shoot? Maybe. That’s an interesting thing. I always remember reading an interview with Chantal Akerman about the way that “Jeanne Dielman” was shot and how you don’t necessarily explicitly notice the fact that she was really short except that eventually, it has this impact on you. I think she was 5’ tall, but the camera is really low in all the shots because she’s standing there looking through the lens. Even though it’s not called attention to, it does have this huge impact on your experience of what you’re seeing. But mainly I think of my love of movies as informing my perspective. I have this sense of the fact that all the shots are static. That the camera never moves is something that is very intentional and inherent in my creative vision that’s about forcing people to stop and slow down and to look in a very mindful, undistracted way. Eisenstein wrote about how he wanted his editing style to create a physiological impact in the viewer, so you really feel the cuts and the edits in the Odessa Steps sequence [of “Battleship Potemkin”]. I feel like I want to do the same thing on the other end of the spectrum, that you really do have a physiological experience of calm by basically not cutting and that you have this static feeling of space. Clearly, history is important to you. Are you conscious of the fact you’re preserving these places and moments by capturing them in this way? That is always the underlying agenda I feel I have underneath everything — that I am a kind of essential documentarian in that I’m literally documenting the landscapes of California. Aside from what artistic use I put them to, it is almost like newsreel footage or the ultimate definition of veritas, of what this landscape looks like. There’s something to be said for a static long take where you can really is a documentation of the landscape. I like to joke that I would love to be proclaimed the filmmaker laureate of San Francisco and that it would just be my job to go around and shoot the landscapes. Is it meaningful to go back to Sundance a decade after “The Joy of Life” with a new feature? To have a venue like Sundance, particularly as an experimental filmmaker, is incredibly validating and reassuring to be able to show work in that context. It really gets me through the difficult times to feel like I’m shooting for that goal. Just having that as a goal to shoot for is inspiring in and of itself, but then to feel cultivated as an artist is just so valuable. “The Royal Road” will be on VOD and DVD on September 6th. Interview: Peter Strickland on the Seduction of "The Duke of Burgundy"
Interview: Julius Avery on Getting a Handle on the Wily "Son of a Gun"